About a dozen staff members from the Child Nutrition Services and Career and Technical Education (CTE) departments of Charlotte-Mecklenburg Schools gathered at a meet-and-eat session held Feb. 8. 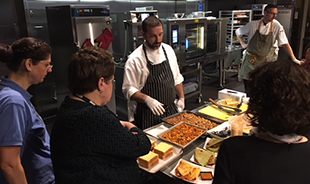 The gathering launched a new partnership between CMS, the Piedmont Culinary Guild, the American Culinary Federation Chefs of Charlotte chapter, Central Piedmont Community College and Johnson & Wales. The partnership will pair local chefs with school cafeteria staff and culinary-arts educators in CTE to provide additional staffing, professional development and expanded menus for school cafeterias. The session was arranged by foodservice consultant Swanson-Girard & Associates and Jody Francisco, CMS manager of culinary development. Also in attendance were chefs from national foodservice companies, as well as local chefs. “All of us share the same passion of wanting to make a difference in the lives of children by providing better meals to kids,” said Jason Ziobrowski. He is a corporate chef for InHarvest, a national supplier of rice, grains and legumes. Chefs were tasked with creating recipes using staples from the CMS pantry. The cooking session allowed the cafeteria managers and Child Nutrition leadership to learn new techniques and tips from the industry chefs, as well as new concepts for existing menus. 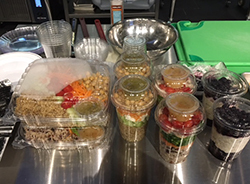 Among the dishes they created were vegetarian and meat quesadillas, tossed salad in cups, a quinoa and blueberry parfait with yogurt, dips and sauces, whole-grain rice bowls with Thai and Caribbean flavors, flatbread pizzas and a fresh corn-and-cilantro salsa. The afternoon was spent sampling the recipes and the reviews were favorable. “I love the direction we are headed in and am looking forward to expanding the flavor palettes for kids,” said Laura Dolan, cafeteria manager at South Mecklenburg. 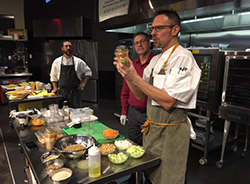 The international flavors were intentionally included in the mix as a way to pique students’ curiosity and increase their exposure to different kinds of food. The session also included a motivational presentation by parent volunteer Chuck Asher, who is a corporate chef. He emphasized the importance of building teams and creating an atmosphere of acceptance in the kitchen. The CTE and Child Nutrition staff members were a receptive audience – and they had fun, too. The session was designed to give CMS food staff wider exposure to local and industry resources. “The volunteer-chef concept is a way for our staff to have on-site support and access to local industry professionals who want to give their time and expertise to assist our cafeteria managers,” said Francisco. Cafeteria managers in CMS provide more than 137,000 meals daily, Francisco said, noting that speed was essential in providing hundreds of meals in 20-minute lunch periods. Additional sessions are planned to continue building resources for school food staff, he said.